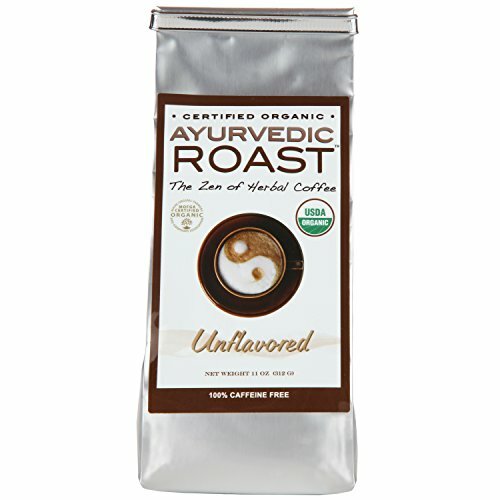 If you’re looking to kick the coffee or caffeine habit, or you’ve tried other coffee substitutes and coffee replacement drinks without success, it’s time to start your day with Ayurvedic Roast! Our gourmet USDA certified organic product is made of roasted barley, chicory, and rye mixed with three antioxidant and adaptogenic herbs that are commonly used in Ayurveda: ashwagandha, shatavari, and brahmi. The result is a healthy, delicious drink with a rich flavor that naturally emulates coffee and contains hints of chocolate. This is the best coffee substitute because of its numerous health benefits. It is caffeine-free and vegan and does not contain GMOs. It does not contain wheat and is low in gluten (9 parts per million) when brewed using a coffee maker with a standard filter. It is not acidic and is the only coffee alternatives we know of that includes all organic ingredients and Ayurvedic herbs. Let’s take a look at the three powerful herbs we use in our blend: Ashwagandha, sometimes referred to as the ginseng of India, has been used for thousands of years in the Indian Ayurvedic system of medicine. Over 200 studies have documented the herb’s ability to help improve thyroid function, reduce stress, anxiety and depression, increase stamina and endurance, reduce brain cell degeneration, stabilize blood sugar, lower cholesterol, and boost immunity. Shatavari, also known as Indian asparagus, has been shown to aid in the treatment of neurodegenerative disorders. It is an antioxidant that supports a strong immune system, combats indigestion, and can help to prevent or relieve a cough. Brahmi, also known as bacopa, has been shown to reduce stress, anxiety, and depression. It can also improve memory, focus, attention, and other cognitive functions. In part due to its ability to help regulate dopamine and serotonin, preliminary studies have indicated that it might also be helpful in treating a variety of mental conditions. CLOSEST TASTE TO COFFEE - Ayurvedic Roast is as close as you can get to a cup of real java. It has a deep, nutty taste and provides energy without the side effects of caffeine or damaging acid from coffee. ORGANIC - All the ingredients in Ayurvedic Roast are certified organic, minimizing your exposure to harmful chemicals and maximizing nutritional value. Organic means better for your body and more sustainable for the environment. HEALTH BENEFITS - This premium product does not contain caffeine, GMO ingredients, sugar, nuts, or dairy. Its special blend of Ayurvedic herbs sets it apart from other non caffeinated beverages, providing antioxidants, supporting immune function, and also helping to relieve stress and promote relaxation. BETTER SLEEP AND DIGESTION - Coffee has high acidity, which is linked to digestive problems, and its caffeine content can also cause difficulty sleeping. Since Ayurvedic Roast is non-acidic and contains no caffeine, it is gentler on your stomach and will not give you the jitters or keep you up at night. BREWABLE - Inside the bag, you'll find a fragrant course ground mixture that can be brewed in any way you would brew regular coffee. It is not an instant product, but you can prepare it in minutes using a coffee machine, percolator, French press, or by boiling it in a pot. The grounds become soft after brewing and are edible. For a low gluten drink, use a coffee maker with a standard filter. You can drink it hot or warm, or even get creative and try it cold to replicate an iced latte. If you have any questions about this product by Ayurvedic Roast, contact us by completing and submitting the form below. If you are looking for a specif part number, please include it with your message. Origin Yerba Mate Solstice Cacao, Buttery, Chocolatey, Delicious!